I spent some time this weekend in my stamp room. 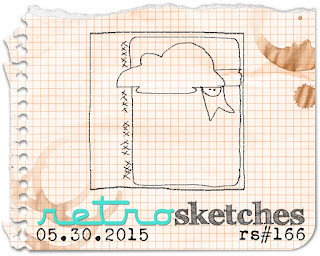 It was cold and dreary so when I saw this weeks RetroSketches. I decided to match the weather and create a card using a new Stamp Set I got from Stampin' Up, Sprinkles of Life from the new 2015-2016 Catalog which went live yesterday! The Sprinkles of Life stamp set is this years Ronald McDonald Stamp Set where Stampin' Up! donates $3 for each stamp set sold to Ronald McDonald charities. What is great about this stamp set is that there is a matching punch, the Tree Builder punch, which coordinates with his stamp set making punching out the images such as the clouds very easy! The color scheme is Tip Top Taupe and Pool Party. I used silver glitter paper to help with the silver lining and the greeting is stamped in Chocolate Chip ink. Hoping the weather warms up and brightens up soon! Although I am glad I was able to make some time in my stamp room without feeling guilty about not being outside enjoying the weather.